I got back from work the other day to find a pig ark in the second field (I really need to name these fields). I had mentioned to someone the other day that I was after one for the right money and they delivered! Shame they didn't say they were coming, it was a complete surprise. Still it's just what I wanted and should be great for a couple of weaners next year. It's insulated but has no floor so I'll need plenty of straw for bedding. The Pair of mole grips above say something about how I was brought up. I remember not going on a family holiday with my Mother, Father, sister and brother for two reasons - I was at that grunty 16 year old stage where I'd argue with my own shadow and the fact that dad wanted me to look after the stock on the farm. When they returned from their week in the sun I was expecting great, if a little trashy, presents. Things like a notebook with the name of a town I hadn't been to on, lots of chocolate and maybe a bottle of booze. Instead dad passed me a red and black box with a pair of mole grips in, "Look after these, they're a good set. Better than the rubbish your mum was going to buy you." So that's why it didn't surprise me when I found myself fixing the washing machine after work this week. Lay on the tiles with the pair of mole grips in one hand and a torch in the other. The thought of calling someone in hadn't even crossed my mind. Luckily I found the problem fairly quickly, a hole in the sump hose. I'd like to blame someone else for this, but as the pipe still contained three rusty screws, two rusty screwdriver bits and a rusty nail I already know who to blame! With the wonders of the Internet I found and ordered the part and got it delivered next day. Then with the skills and dexterity that I thought only gynaecologists possessed, I got the hose back on and we could attack the pile of washing that only a 8 month old baby could produce! Total cost of fixing the washing machine was under £30 including postage. Anyone else find it hard to get other people in to do work? I wanted a few more trees to fill the rest of the area I've set aside for the orchard, some damsons and a couple of other apples or pears. 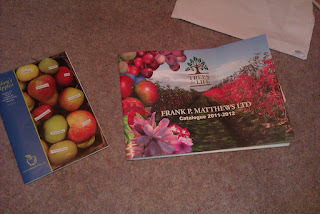 But it got me thinking as I went through the catalogues how much I love all the different sorts of apples you can grow (I eat at least two apple everyday of my life) and how it would be great to have a big selection of them without taking up too much space. 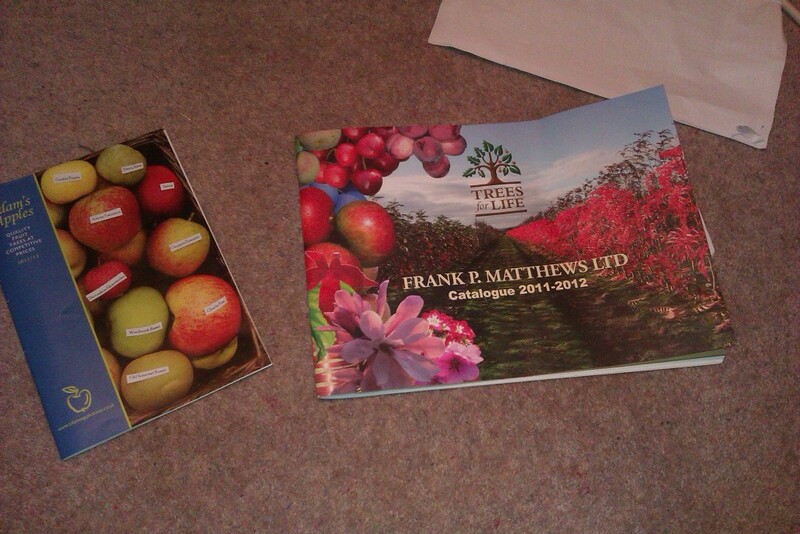 So I've decided I'm going to separate the veg garden from the field with cordon apple trees. Lots of different sorts of cordon apple trees, I've been sorting through some of my books and catalogues to decide what varieties to start with (and to make sure they're spur not tip bearing). With a few ordered for my mother and one as a present I managed to get my order over the 25 trees needed for a large discount. From American Mother through to Winter Gem, this divide in the garden will have 22 types of apple in it, along with the 11 in the orchard already making for a nice selection of 33 apples varieties to pick and eat in years to come. I've just got to get the ground ready along with the posts and wire before the trees come in the winter. (on top of this I've also ordered three damsons as well). Whats everyones favourite sort of apple? I'll order it next year if I haven't already got it! I know to a "proper" farmer 21 round bales of hay isn't much. I know this because I grew up on a proper farm where most of our fields were bigger than the total area of what I've got now. But I'm still quite proud of our first little harvest. The hay is really good quality, smells really sweet and we baled it at just the right time (the weather sounds like it's going to break next week). We don't have any ruminant stock and we've no where to store the bales in the dry (planing permission was turned down for a barn) so a hand painted sign on the side of the road is all we've got at the moment, just hope someone rings before they get too wet! If we sell them I'll put the money towards getting permission for a barn so next year we're not in such a hurry to sell them. It's been a busy week this week. Coming home from work I've had to turn the hay to get it to dry, although doing this in the evening isn't as good as doing it in the mid-day sun, i wanted to get it ready for the weekend. Yesterday evening I book the contractor to come and bale my three little fields on Saturday. I'd have it all rowed up and ready for him, just had to pray for sunshine. We woke up to a thick fog this morning and it took until half ten to clear, I then turned it all before lunch so the sun could dry the underside, after lunch I went out and turned the wet bits under trees and round the edges again before setting the hay bob to row up. I rowed up all three fields then went to unlock the road gate just as "spike" the contractor turned up! I didn't put cutting hay as the title as we're probably going for silage, but it doesn't matter as today we finally cut the grass on our three fields! This is long overdue but with the weather being rubbish and being so busy it just hasn't happened. Dad's kit is massive in these little fields so they were mown in no time at all and as it's a mower conditioner it fluffs the hay as well, saving having to turn it the first time. I didn't get to mow the grass myself this year (new mower so no chance) but hopefully by next year I should start to get some of my own kit for mowing, turning and bailing. There seems to be plenty on the field and it looks like good stuff, just got to hope for good weather now!